Marjorie “Slim” Woodruff is a contributor to Writers on the Range, the opinion service of High Country News. She works and writes in the bottom of Grand Canyon. Six: That is the number of times I’ve frantically dashed out of a slot canyon because it started to rain. Once that happened when I was leading a well-advertised Sierra Club hike to promote wilderness with a capital W. We had hiked in four miles to the start of the narrows and set up camp when it started to rain. “Change of plans,” I announced, and hiked everyone back out. Did I get a modicum of flak? Just a bit. I also have turned around a half-hour from a summit if there was lightning in the distance. This earns me great distain from those who soldier on, only to return to share selfies showing their hair standing on end and sparks dancing along their pack frames. Called “chicken” much? Oh, yeah. You get used to it. The intrepid ones get away with it. Usually. They go in — and out — of a narrow slot canyon in the rain. They climb in the lightning. They complete their 20-mile hike with one liter of water when the temperature tops 120. It works. Except when it doesn’t. I have been in situations where I really, truly thought I might not make it. Did I think, “Oh, I am in the Grand Canyon, in a blizzard, the trail is under three feet of snow, I have lost feeling in my feet, but this is definitely where I want to be?” No! I was pretty much thinking, “There’s no place like home, there’s no place like home,” and frantically clicking my heels together. Navigating Kanarraville Falls in Southern Utah. Usually, if one is trapped in extreme circumstances, it is not pleasant. Climbers huddled on top of K2 in the Death Zone. Hikers in a tight canyon flushed down by a six-foot-high wall of water. Cross-country skiers shivering the night away at 10,000 feet around a dinky survival fire. (Been there). Not fun. That said, we don’t really want to venture into the wild only when conditions are ideal. For one thing, we would probably never venture out at all. Part of hiking involves being hot, or cold, or uncomfortable, or scared, or lost. I have had a wonderful time crouched under an overhang watching a flood sweep by, safely below me, while rockslides crashed down on either side. I have gloried in a rainbow during a brief break in the clouds. I have felt empowered and capable when I forged my way through fresh-fallen snow on an unmarked route that no one else could find. I have also sat inside, watching a goose-drownder of a storm wipe out the back yard, and thought, “I’m glad I’m not out there today.” Then I fix another cup of cocoa and bake cookies. There are acceptable risks, and there are the “What on earth were they thinking?” kind of risks: The kind where visitors to the Grand Canyon scorn the “enter and die” signs and climb over the railing. 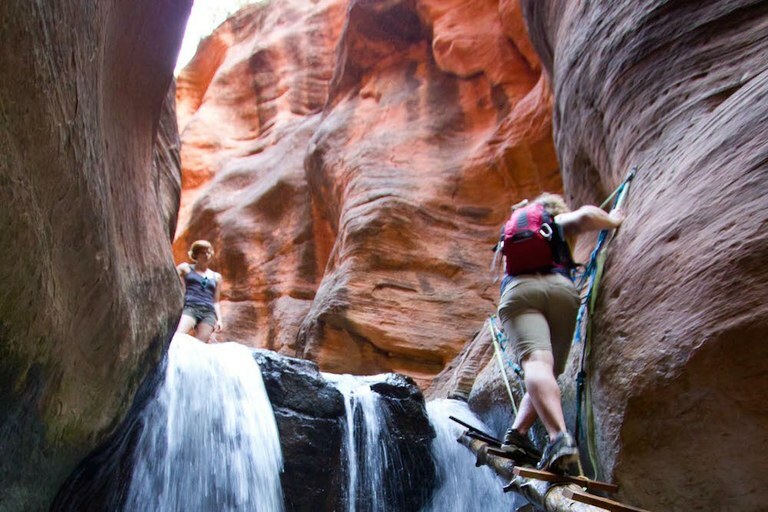 When Utah canyoneers scoff at park rangers who warn that when the forecast is for a 60 percent chance of precipitation, entering a slot canyon is counter-indicated. When skiers gleefully duck under the “avalanche danger” sign. When lightning smashes into the ridge one mountain over.